NESCA News & Notes: Not-So-Quick Fix: ADHD Behavioral Therapy More Effective Than Drugs in Long Run? Not-So-Quick Fix: ADHD Behavioral Therapy More Effective Than Drugs in Long Run? "Cognitive and behavioral therapies that help young people reduce impulsivity and cultivate good study habits are costlier and take longer, but may be more efficacious over time..."
Before stimulant drugs such as Ritalin, Concerta and Adderall began their rise to popularity in the 1970s, treatment for attention-deficit hyperactivity disorder (ADHD) focused on behavioral therapy. But as concerns build over the mounting dosages and extended treatment periods that come with stimulant drugs, clinical researchers are revisiting behavioral therapy techniques. Whereas stimulant medications may help young patients focus and behave in the classroom, research now suggests that behaviorally based changes make more of a difference in the long-term. A new synthesis of behavioral, cognitive and pharmacological findings emerged at the recent Experimental Biology meeting, held last month in San Diego, where experts in ADHD research and treatment gathered to present their work. Their findings suggest that behavioral and cognitive therapies focused on reducing impulsivity and reinforcing positive long-term habits may be able to replace current high doses of stimulant treatment in children and young adults. Recent surveys indicate that 9 percent of all children in the U.S. have been diagnosed with ADHD. The condition's core symptoms include hyperactivity, inattention, inability to perform monotonous tasks and lack of impulse control. Children with ADHD have trouble in school and forming relationships, and 60 percent will continue to suffer from the disorder well into adulthood. As of 2007, 2.7 million U.S. children and adolescents with ADHD were being treated with stimulant drugs. But new research reveals that these drugs are not necessarily the panacea they have been thought to be. Psychologist Claire Advokat of Louisiana State University has been looking at the effects of stimulant medications in college students to see what improves with medication and what does not. As expected, she found that people diagnosed with ADHD had lower grades and ACT (American College Testing) scores; they also dropped more classes than their peers. But she also found that these issues were not improved by stimulant medication. "If students had good study habits, they did not need the medication to bolster their grades." Instead, Advokat’s new findings indicate that the ADHD students naturally divided into those who had good study habits and those who did not, regardless of treatment. If students had good study habits, they did not need the medication to bolster their grades. It is not that medication has no effect, Advokat hypothesizes that "it may be that the medications can help, not in helping you remember, but in helping you form the good study habits" necessary for academic improvement. This outcome suggests that if ADHD patients could learn good study habits early on, medication could become less necessary. Other research has examined the role of behavioral interventions not only for school-age children, but also for their parents. Parents of children with ADHD tend to exhibit more parenting-related stress and difficulties than do those of non-afflicted offspring. 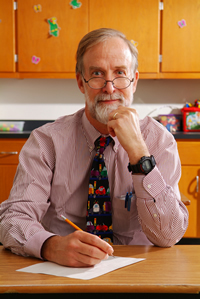 After training parents in stress management and giving them behavioral tools to help their children, psychologist Bill Pelham of Florida International University and his colleagues saw significant improvement in their children's ADHD-related behavior, such as the frequency of classroom disturbances. "...data suggests that lower dosages combined with behavioral therapy may provide a far better outcome than stimulant medication or behavioral therapies alone." Independently, Pelham has also shown that behavioral therapy for children also produced effects that were equal to some doses of medication. His data suggests that lower dosages combined with behavioral therapy may provide a far better outcome than stimulant medication or behavioral therapies alone. Cognitive therapies may also boost improvement: In a 2011 PLoS ONE paper, Julie Schweitzer and colleagues in the psychiatry and behavioral sciences department and the MIND Institute at the University of California, Davis, showed that children with ADHD show extra activity in brain areas associated with "task-irrelevant" information during working memory tasks (those that depend on one's ability to hold and focus on information for immediate reasoning and recall), suggesting that they have less efficient cognitive control. New unpublished results from Schweitzer’s team have shown that cognitive therapy could improve control, again potentially reducing the need for medication to "drown out" extraneous information. Advokat, Schweitzer, Pelham and other scientists at this year's confab agreed that behavioral therapies deserve their renewed focus. These therapies create no drug-tolerance and come with no concerns about future substance abuse. The trick will be identifying which of the new therapies is most effective, and making those therapies affordable. For now, stimulant medications are much cheaper and act faster than behavioral therapy, even if the latter may be the most effective in the long run. But experts as well as parents know that the long run is what matters most.